August 8: Wigan Warriors announced Shaun Edwards would be returning to his hometown club in 2020, with Adrian Lam holding the reins until then. The statement said he had "signed" - not agreed - a three-year contract. August 9: Edwards and Lam join chairman Ian Lenagan at a press conference at the DW Stadium to discuss their moves. Edwards admitted he was "taking a risk" returning to league, giving up the security of a union coaching career, but said he was prepared to take it to return to "a special place". August 10: Edwards sat with Lenagan in the directors' box and watched Wigan beat Castleford 24-20 at the DW Stadium. January 15: The first hint that Edwards' move to Wigan for 2020 was not locked in. During interviews ahead of the Six Nations, the Wales defence coach described moving to the Warriors as "an option... but things could change, you just never know what's around the corner." January 16: Lenagan responded to Edwards' remarks. "Shaun has kept us up to date and we talk regularly," he said. "And if Adrian Lam wins every trophy available then that would be a nice dilemma for Shaun, Adrian and Wigan to have. We will all do the right thing by the Wigan club." January 18: Edwards stood with Lam and watched a young Wigan XIII beat London Skolars in the Capital Challenge friendly match. February 25: Edwards again casts doubts about "when and if" he takes charge of Wigan during an interview with BBC Radio Four, and makes it clear he is not finished in union. "The pressure of coaching Wigan rugby league with the history of the club, it's very intense," he said. "When and if that challenge comes along I'll be ready to try and answer that challenge. If I do a year or two in Wigan, or whatever, there's plenty of time to come back to rugby union." Lenagan declined to comment on the remarks. February 27: Lam is asked in his weekly press conference if he had been asked about extending his stay beyond this season if Edwards didn't join. "I haven't looked, I haven't talked, I haven't spoken to anyone about it," said Lam. March 1: Rumours circulate Edwards is wanted by former club Wasps. March 17: Edwards reveals he has not signed a contract with Wigan and will be a free agent once his commitments to Wales finish later this year. "I haven't signed a contract with anybody yet," he said. "As it stands, come the end of the World Cup I'm unemployed. "I agreed with Wigan and thought we would sign a contract. "But then Wigan said, 'it's OK, we'll sign one later', and I thought that was unusual. And that was nine months ago. I agreed to go to Wigan, but I never signed a contract. I'll consider all offers, league, union." March 18: The Times reports a deal is in place for Edwards to join Wasps. But the newspaper says no deal has been signed as he waits to see if England RU are interested in taking him on board. March 18: Wigan issue a brief statement, saying that since Edwards' comments about his contractual situation, "We have been seeking dialogue with Shaun directly since Sunday to clarify to Wigan his intentions." March 22: Lenagan issues a statement admitting he had an "oral agreement over a handshake" with Edwards, and agrees to Edwards' request for more time to consider his future options. April 8: Edwards tells PA he has yet to make a decision on his future. 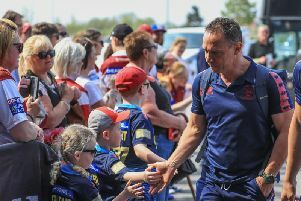 April 14: The Sunday Times reports Edwards is close to finalising a deal with Wales RU to extend his stay as defence coach. April 15: Wigan and Edwards release a joint statement, confirming he will not be taking up the offer to return home. Edwards says his decision was not motivated by money, but felt he was not the best man for the club.